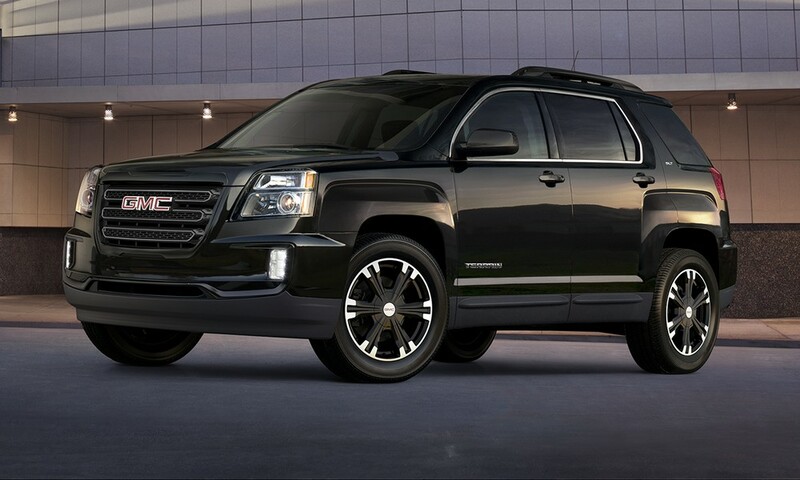 For 2017, the GMC Terrain gets new 18-inch alloy wheels and a pitch-black "Nightfall" appearance package as an option. As General Motor's truck brand for decades, you can rest assured that GMC knows what it's doing when it comes to trucks and SUVs. And nowhere is that more apparent than with the 2017 GMC Terrain. The Terrain charges into the 2017 model year boasting a robust list of tech options, in-demand features, and modern styling. The 2017 GMC Terrain is offered with two powertrains that give this mid-sized family hauler plenty of oomph, and decent fuel economy as well. The standard engine is a 2.4-liter four-cylinder which produces 182 horsepower and 172 pound-feet of torque. It’s offered with a six-speed automatic transmission only, and choice of either front-wheel drive or all-wheel drive. For those looking for more power, the Terrain can be had with a 3.6-liter V6. This particular model produces 301 hp and 272 lb-ft of torque and, like the four-cylinder, is paired with a six-speed automatic and either front-wheel drive or all-wheel drive. GMC is an upscale brand, meaning even the base Terrain SLE-1 comes with a long list of standard features, including new 18-inch alloy wheels, a rearview camera, auto-dimming rearview mirror, and tilt/telescoping steering column. Building on the standard features of the SLE-1 is the SLE-2. On top of the applicable standard features from the base model, it includes a power-adjustable driver’s seat, Pioneer® premium eight-speaker audio system, automatic climate control, roof rails, and a leather-wrapped steering wheel. The SLE-2 is also available in a special Chrome Edition that will make your Terrrain shine with a unique chrome grille design, chrome door handles, chrome manually folding exterior mirrors, and other accents. Next up is the SLT, which adds 18-inch wheels, chrome exterior accents, remote engine start, ambient lighting, heated front seats, and perforated leather upholstery. The new Nightfall package is available on SLE-2 and SLT models and includes blacked-out exterior details with an edgy attitude. Choose from Summit White, Onyx Black, Graphite Gray Metallic and Crimson Red Tintcoat exterior colors enhanced with a charcoal grille with gloss black surround and accents, black front and rear fascia accents, body-color door handles, and more. 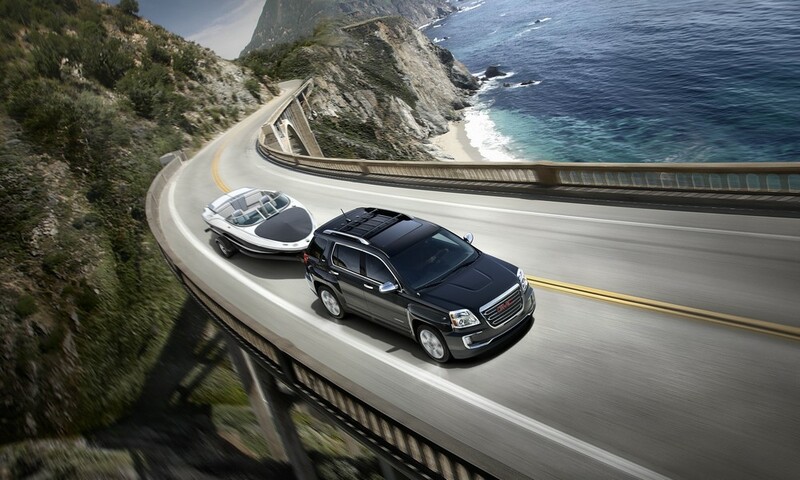 For an even more upscale experience, we recommend the top-of-the-line Denali model. Like other GMC models that share this name, it comes with upgraded exterior styling features headlined by the Denali-signature chrome grille, and virtually every item offered standard or optionally in the other trim levels. Notable options primarily fall into the realm of tech. The Terrain is available with GMC’s IntelliLink® infotainment system, including navigation and a color touch screen. 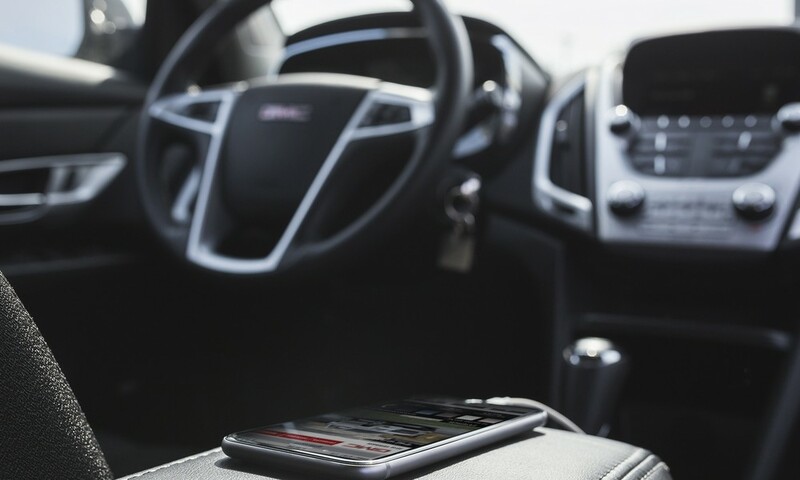 All Terrain models also come standard with OnStar® 4G LTE capability and a built-in Wi-Fi hotspot that can support up to seven devices, but both OnStar® and the Wi-Fi service require separate subscriptions. If you find yourself wishing SUVs looked tougher these days, then we can't recommend the 2017 GMC Terrain enough. The Terrain is bound to gain admirers wherever it roams thanks to its athletic design and imposing frame. Of particular note are the large wheel openings and enormous chrome grille capped with big GMC letters. On the inside, the Terrain features standard ambient lighting and GMC’s MultiFlex sliding rear seat, which can be moved fore or aft eight inches to increase legroom. The 60/40 split-folding seatback makes carrying large items easy as well. The cargo area offers 31.6 cubic feet of space. Standard safety features on the 2017 GMC Terrain include anti-lock brakes, StabiliTrak® stability control, traction control, and six airbags. Forward-collision alert, lane-departure warning, blind-spot monitoring, and rear cross-traffic alert features are also available as options. From its beefcake body to its plush interior, the 2017 GMC Terrain was built to impress and instill ​confidence in drivers, all while pampering occupants with all the luxury and refinement we've all come to expect from the GMC brand. For an opportunity to find out just how capable the 2017 GMC Terrain truly is, stop by or contact us at Rivertown Buick GMC to schedule a test drive.